Recent research on coastal archaeology undertaken for Cadw by the Welsh Archaeological Trusts has highlighted the lack of archaeological knowledge of harbour locations and remains. This includes both the archaeology of early landing places, the development of the medieval port, and the early post-medieval ports until they were superseded by the larger railway-linked ports of the later 19th century. The aims of the 2005-6 project were to undertake an archaeological assessment of five harbours in Gwynedd, and to recommend management proposals that clearly reflected the use and management of the harbour, and would be useable by those involved with the management of ports and the coastal zone. A desk-based assessment was undertaken for each. The regional Historic Environment Record formed the starting point, but the high number of standing buildings involved with the project meant that the records of Listed Buildings also provided significant relevant information. Primary source material included the OS County Series maps from the late 19th century (usually c. 1888-1890) to the early 1920’s. County Tithe maps, and relevant estate maps, in particular for Conwy, though less so for the others, have proved useful. Secondary sources, in particular railway histories by Boyd and Baughan, have been of particular use. R. Chamber Jones has undertaken a considerable amount of work on Felinheli, and Lewis Lloyd at Harlech. The Cadw guides to the castles have been of considerable use, as well as earlier descriptions of the castles by writers such as Harold Hughes and Sidney Toy. The works by Colin Gresham in the area around Criccieth have provided information on the development of the borough. Four of the harbours included within this years project were chosen to examine the maritime relationships of Edward I’s castles and boroughs. It was usual for each castle to have its own dock, which would have allowed protected passage between the ship and the castle. This was certainly the case at Conwy, Beaumaris and Harlech, where remains of each are visible, though that at Beaumaris remains the best preserved. The dock at Conwy was destroyed by the construction of Telford’s London to Holyhead road in the 1820’s, but it formerly lay below the east barbican. We do not have a clear understanding of sea access to Harlech, though it remains probable that a channel, at least, led to the water gate at the foot of the cliffs. Criccieth was initially designed by Llywelyn ap Iorwerth, and was not designed with a castle dock. The second maritime element was the town quay, which was where the majority of the trading took place. All the Edwardian boroughs were developed with a harbour as part of their intrinsic design, with the excecption of Harlech. This borough was perched high on the rock above the sea, with poor access to the beach below, so a trading harbour never developed here, though related harbours developed to the north and south at Ty Gwyn y Gamlas and Mochras. A masonry quay has been identified at Conwy, buried beneath the 19th century developments, located like the one at Caernarfon along one length of the town walls. At Beaumaris the quay developed within the sheltered beach between Gallows Point and Townsend, reached from the town through the Water Gate. At Criccieth the harbour developed in the bay east of the castle, and below the Edwardian borough. 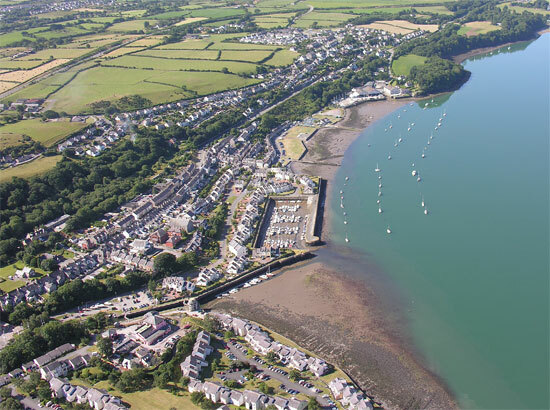 The slate harbour at Port Dinorwic was examined as a comparison with the slate harbours of Penrhyn, Caernarfon and Porthmadog which were assessed in the first year of the study. It bears close resemblance to the development at Penrhyn, as both were owned and managed by a single estate, and were dependent upon a single quarry, and fed by a private tramway. Port Dinorwic is of particular interest as a late example of an engineer designed dock, with an entrance lock, inner basin and dry dock, built 1897-1902.